I rarely use primer but I read many rave reviews about this primer and I thought I should give it a try. 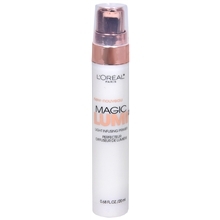 It gave a nice healthy subtle glow and gave my face a smoother texture because of the light refracting particles or Byron according to the labels/ads. My makeup did last a bit longer but it didn’t give the same drastic results from the ads in their magazines. Although, most of the marketing ads for cosmetics should be taken with a grain of salt, since it is very hard to duplicate the same results. While I did like the soft glow, it didn’t notice that much of an improvement in my skin [although, other people noticed it]. I would probably save it for special occasions and/or when I wear the “natural makeup” look. In the late winter and early summer my skin looks like a scaly desert. As unpleasant as that sounds it feels more unpleasant. Apart from the dry scaly appearance, my skin is also itchy and just quite uncomfortable. 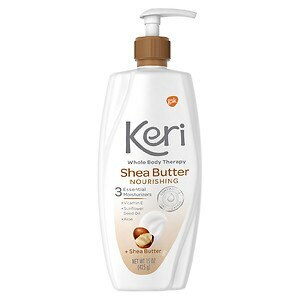 I have heard of the moisturizing and hydrating effects of shea butter and I heard this lotion had ample amounts of shea butter. The lotion is very thick, greasy and leaves a sticky residue because of the shea butter. I usually wear it a bit before going bed [I don’t like wearing lotion after showering] to allow it to fully absorb, otherwise I would stick to the sheets and everything else, but when I wake up my skin is soft and renewed. I use this as a weekly treatment rather than a daily lotion.